I was reading all about Peter jumping out of the boat and walking across the stormy waters toward Jesus. I always have loved this story. The faith it took for Peter to leave the safety of his boat. The love he had to have for his Savior to desire so much to be near him. And the fact that even when he falters, Jesus holds tight. Thing is, I've always pictured Peter mid-walk when he starts to sink, but this read-through something stood out to me. He begins to sink and calls, "Lord, save me!" For Jesus to be able to merely stretch out his hand and take hold of Peter means Peter was only an arm's length away when he began to sink. He was that close to Jesus and yet faltered. It gave me pause. You see, sometimes we can fool ourselves into believing that if we have a close relationship with Christ, faith comes easily. 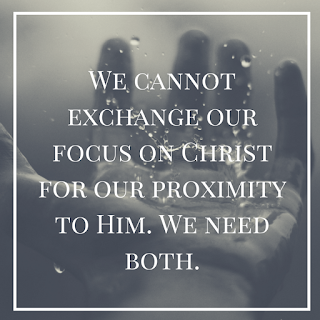 That our proximity to Christ can stand in for our focus on him. But that is so not true! Yes, we need to be close to him, but we also must continue to keep our eyes on Jesus because it's where our faith draws strength. If we begin to look at the storms of our life, it doesn't matter how tight our relationship is with Jesus, we will falter. We need both; to be so close to him there's not a breath between us, and so focused on him that we see nothing else. Proximity and focus. The best place to stand with the best view. I have never thought of it that way before! Peter was thisclose.